It’s a multi-generational family story tracing the history of Iraq from before the Saddam years to after the American invasion. One of the blurbs says “García Márquez for Colombia and Al Galidi for Iraq”, and the book is in that kind of magical realist tradition; although as with a few books I’ve read recently, I find myself wanting to refer to ‘magical realism’ even though there isn’t actually much magic in them. A book like One Hundred Years of Solitude has genuinely impossible, supernatural events in it; Thirsty River has some unlikely, striking events, but they are not generally supernatural. But there’s a similar mood, a kind of theatricality, with odd things happening to slightly odd people. Of course there’s nothing exclusive to magical realism about exaggerated characters and slightly implausible plots; you could say the same about Dickens. And I wonder if I would even think of referring to it as ‘magical realism’ if it was set in Surrey rather than southern Iraq. But there’s still something that seems to connect these books into a sort of genre; perhaps it’s a slightly detached attitude to the central characters? Anyway, such taxonomical considerations aside: I did enjoy it. By the end of the novel the enjoyment was of a slightly mixed kind, because Iraq’s recent history has not been all unicorns and rainbows, and the book’s characters have a pretty brutal time of it. Hadi the Rocket was a middle-aged man. He had a thick black moustache, from which he always plucked the grey hairs with tweezers. In his chest pocket was a comb and a miror, with which he kept his moustache in shape. Hadi the Rocket came from a poor family in Boran, whose members sold ice in the summer, and coal and oil in the winter. His father had owned a cart and an old horse. After primary school, Hadi began to work with his father. He had thought at was his lot to get old sitting int he street, until he became a member of the Ba’ath party. “God in heaven, the party on earth,” he always said when the Ba’ath party was still underground. “The party in heaven, Mr President on earth,” he said when the Ba’ath party seized power and was the only party remaining. “Mr President is the heaven of the fatherland, the party his ground,” was the slogan when Saddam seized power. Sometimes Hadi the Rocket forgot his own house, which the party had given him, his wives, which he had also received from the party, and his children and he slept in his uniform in the party’s house. Every time people became more afraid of him, he felt safer and became friendlier. Little photos of Saddam Hussein were pinned to his clothes and he wore watches bearing his image. he gave the photos to everyone, and the watches to people who were higher up in the party then himself, as if it were an offering to the gods. No one was as attached to anything as Hadi the Rocket was to the Ba’ath party; not medieval suitors to their lovers, nor knights to their swords, nor believers to their gods. * Incidentally, full marks to Luzette Strauss, the translator, for her sparing use of endnotes: just 12 for a 300 page novel. Since I’ve been reading a lot of translated fiction over the past couple of years, distracting and unnecessary endnotes have become a real pet hate of mine. 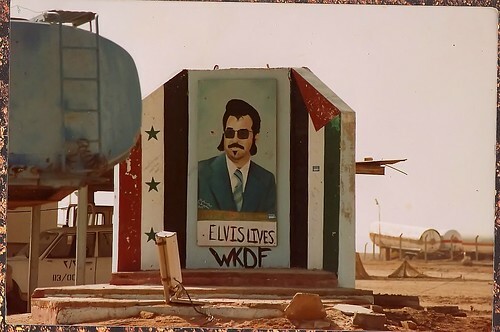 » saddam elvis, originally uploaded to Flickr by and © rakkasan69.